Gov. 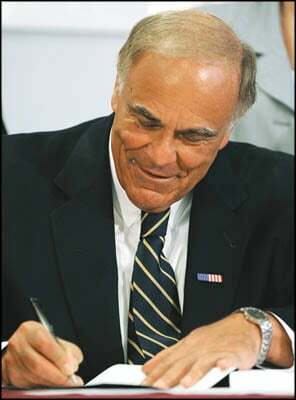 Ed Rendell signed the state budget today. HARRISBURG, Pa. (AP) - The $28 billion state budget that Gov. Ed Rendell signed Tuesday was part of a deal that would boost state borrowing by as much as $600 million to pay for construction projects such as new public buildings that would be named after U.S. Sen. Arlen Specter and the late Rep. John Murtha. The planned increase in the state's ceiling on a portion of its debt will be authorized by legislation that Rendell plans to sign Wednesday. About half of the projects that it will finance are being hand-picked by Rendell, while legislators expect to assemble a second list in the coming months that also must be authorized by legislation before they can receive money. Rendell is earmarking $10 million for the Arlen Specter Library at Philadelphia University and another $10 million for the John P. Murtha Center for Public Policy at the University of Pittsburgh at Johnstown. The Democratic governor also is setting aside $20 million for an "American Revolution Center" in Philadelphia and $30 million for a biologics manufacturing facility in Pittsburgh. He defended the projects at a time when spending in the state's recession-wracked budget is being cut for a number of social services, including autism services, mental health services and county-based family crisis services. 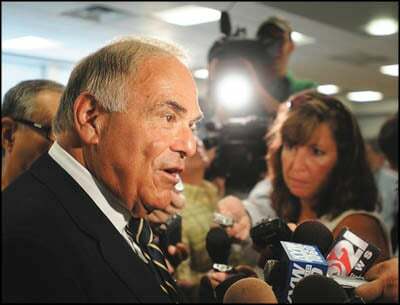 Rendell pointed out that the project money cannot be used to plug holes in the state budget. "Capital money can be spent to make investments that create jobs, that create order for U.S. Steel, lumber, concrete, all of the manufacturing that is important to keeping our economy humming," Rendell said. "It's one of the ways that we've done so well over the years compared to other industrial states." Details about the projects began emerging in the days after the Legislature approved the general appropriations bill on Wednesday. Senate President Joe Scarnati, R-Jefferson, said he and other top Senate Republicans went along with the increase in borrowing because Rendell insisted on it as part of any budget deal. "To get a budget done on time, it took compromise," Scarnati said. Rendell signed the general appropriations bill at Elmwood Elementary in a Harrisburg suburb, which he said is symbolic of the extra emphasis he has placed on early education support. Surrounded by schoolchildren in the cafeteria, Rendell touted his victory in sending an extra $250 million, or 4.5 percent, to public schools for K-12 instruction while lauding Elmwood's improvement in test scores. "Children, you don't know it, but this budget is for you," Rendell said as he prepared to sign the document. The increase for public schools comes during a year when Rendell and legislators sought to deal with a $1 billion-plus deficit. Legislators resisted Rendell's call to impose new taxes on things like tobacco sales and natural gas extraction, and to eliminate a 1 percent incentive retailers get for collecting and submitting sales-tax money on time to the state. He said he would have put even more money into education, but agreed to legislators' desire to divert some money into programs they favor. Those programs range from extra money for hospital burn centers and rural hospitals to discretionary grant programs that, in the past, legislative leaders effectively used to funnel money toward lawmakers' favored local causes, from football fields to music festivals. Rep. Curt Schroder, R-Chester, said Appropriations Committee staff has told him that top legislators negotiated about $100 million into the budget. On Friday, House Appropriations Committee Chairman Dwight Evans, D-Philadelphia, refused to answer questions about how much money legislators negotiated into the budget for grant programs. Senate Appropriations Committee Chairman Jake Corman, R-Centre, said each of the Legislature's four caucuses was able to distribute a certain amount of money into programs its members chose. He said he did not know that figure, but said his caucus put an emphasis on restoring money to programs such as a science education project for mostly rural school districts and a tax credit that rewards charitable contributions to private schools.